It is the morning of the final day of competition. Last night we stopped a bit early (?) and made it back to Belfair around 11:00. Lars made lesson plans while I sharpened chisels. (Thanks for the diamond stone, mom and dad!) Actually, Lars made lesson plans while I had a beer (Belfair home brew) and played guitar. Then I stayed up a couple hours after him to sharpen chisels, and I'm glad I did! I made short work of the head first thing this morning, and I did it all with two freshly sharpened chisels. Meanwhile Lars taught a pre-calculus class and has now arrived at the warming hut to join me in a mid-morning snack. (Unlimited coffee and doughnuts!) We didn't get much sleep last night, but at least we didn't spend the entire night carving ice like a few of the other sculptors. What a beautiful day for carving ice! The weather has been perfect for ice, not too warm, not too cold. After the ice warmed up a bit in the morning and our liquid water cooled down, we worked on the welds and had them done by lunch. They could be prettier, but they are structurally sound. After lunch we finished the mechanism pieces (except for the handle) and performed a trial assembly. Everything fit and had enough clearance through the complete range of motion. Later in the day we turned to the task of removing large quantities of ice to shape the bodies. It has been slow going but is mostly done. While Lars is at school for a bit Thursday morning I'll tackle the head of the realistic penguin. I'm terrified that I will ruin the thing! the penguins are coming! the penguins are coming! Day one was quite successful. Our ice had several large cracks (and the heat of the giant chansaw produced an additional one), but we've managed to work around them well. We have been able to find high quality sections for our mechanical parts. We made a last minute decision the night before the event to increase the overall size of the piece. This has required a considerable effort to add large chunks to the top of the pengiuns, but we think it will be worth it. Hopefully the additional time required to do this doesn't burn us later. By the end of the day we had both penguin bodies very roughly formed, a cavity for moving parts carved out of the mechanical penguin, one of two axle holes drilled, a head roughed out and lifted (oof!) up on top of a body (not yet oriented correctly), and both axles turned on the lathe. Toward the end of the day, we started doing stupid things. Lars had to remind me to get my safety equipment on before using a chainsaw, we forgot that we should have drilled the axle holes before cutting out the cavity, and we drilled a hole through two panels that only needed to go through one. Fortunately we decided to quit early in the evening before doing anything terribly disastrous. That enabled us to get an early start today, and we are making good progress again. Lars had a wonderful (terrible?) idea for a technique to deliver liquid water to a weld. We were attaching the shoulders to the body of the mechanical penguin, so we packed the edges with snow and then drilled a 3/4 inch hole all the way from the top of the shoulder piece down to the thin gap between the parts and poured water right down the hole. Unfortunately the liquid water never spread further than an inch from the hole because, we suspect, it encountered too much snow deposited by the drill bit. Maybe it would have worked if we had blown out the hole with compressed air before pouring the water. Anyway we'll have to try to bond the pieces together better today. We hope to have that and the head of the other penguin done very soon. Watch us on our webcam! We are in site number one this year. Matt, our inside man in the webcam crew, tells us that our webcam was the first one made operational yesterday, so it should be available when the event starts Tuesday morning at 9:00. We might not be there right when the horn sounds, however, due to some scheduling difficulties. Lars has recently been promoted (yay!) to a full-time teaching position at a local high school, but his students have had so many different teachers that they need a bit of stability. For this reason he'll have to teach one morning class on Tuesday and Thursday, but he'll have substitutes for his other classes. Here is our official sketch for this year's Single Block Classic. 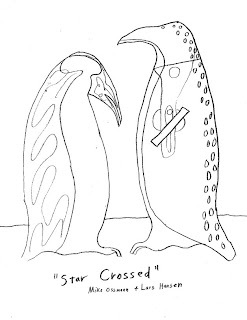 Our plan is to carve a pair of star-crossed lovers, a realistic penguin and a mechanical penguin. The mechanical penguin's head bobs up and down when a wind-up-toy-style key is turned. I am a terrible blogger. As all (three) of you know, I have failed to finish blogging about the 2008 World Ice Art Championships. Now a whole year has passed, and I find myself back at Belfair preparing for the 2009 event! Perhaps I will properly finish telling last year's tale at some point, but I want to start blogging about this year, so here is a quick summary: Lars and I constructed what we felt was our best sculpture yet, but the machine portion was non-functional. The primary mechanical problem was that we failed to make gears precise enough to mesh (so what else is new). We did, however, complete a giant half gear, several smaller gears, the flywheel, and axles. Then we made an abstract sculpture with rounded edges and round gears on one end and square edges and square gears (not even pretending to be functional) at the other end. It was great fun and hard work, and we ended up rather burnt out (a contributing factor to the non-blogging condition). On to 2009! We are back in action with a great new design. We contemplated trying a non-mechanical sculpture this year (I suggested penguins). We also had an idea for a simpler, gear-less mechanical windmill. We ended up deciding that mechanical ice sculpture is our own particular. . . idiom, so a machine it will be. We combined the ideas and intend to produce a mechanical penguin. No gears! Our goal has been to produce a mechanical sculpture that is visually interesting yet requires minimal preparation. We haven't constructed any new tools this year! I'm sure we'll enhance our arsenal in the future, but we needed a year without the hundreds of hours of tool preparation that has kept us so busy in the past. It will be fun to see what we can create using only previously developed tools and techniques. Dominic and I had a great time at ShmooCon. Our talk was fun and well attended. Video of the talk will be posted "soon." Slides (PDF, ODP, PPT) and code are up. We met a lot of great people and had some interesting feedback and discussions of new ideas. We're still working on this stuff, so hopefully we'll have something even better to show off later this year. Dominic Spill and I are presenting Building an All-Channel Bluetooth Monitor at ShmooCon this weekend. It should be fun!